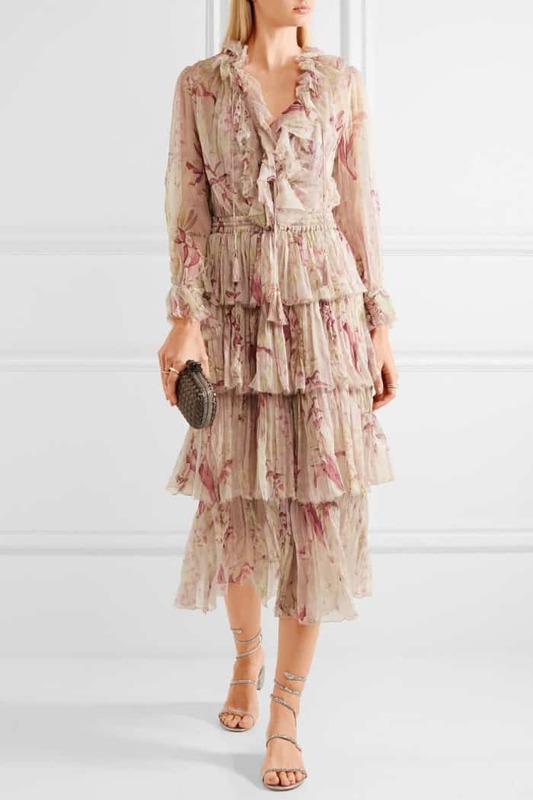 Rene Caovilla is a brand known for its masterful craftsmanship, meticulous attention to detail and bejeweled creations that exude luxe elegance. 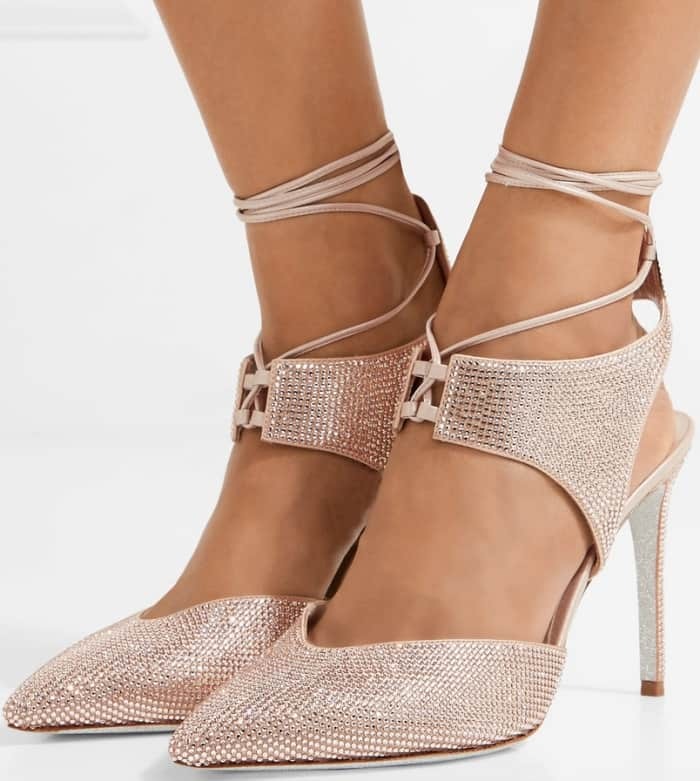 The Italian label’s opulent shoes instantly elevate any outfit with signature touches such a iconic snake designs and Swarovski crystal embellishments. 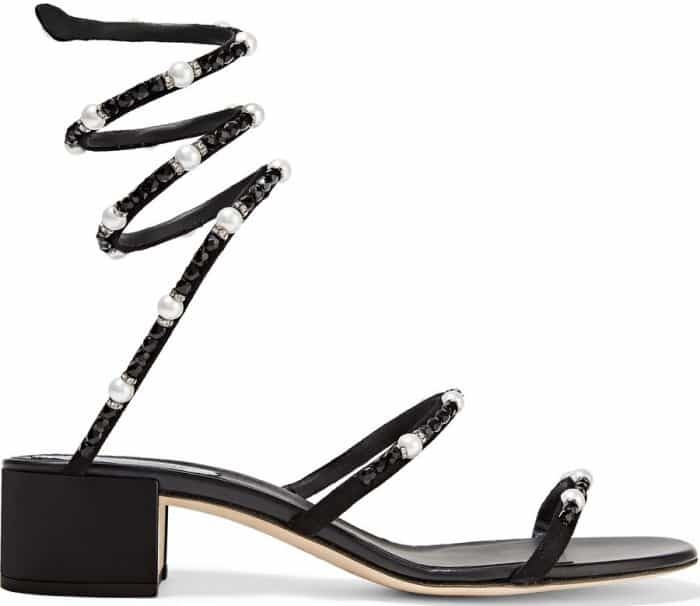 So, if you’re looking to add a touch of sparkle to your ensemble, look no further than an embellished pair of shoes from Rene Caovilla, which you can purchase from Farfetch and Net-A-Porter. 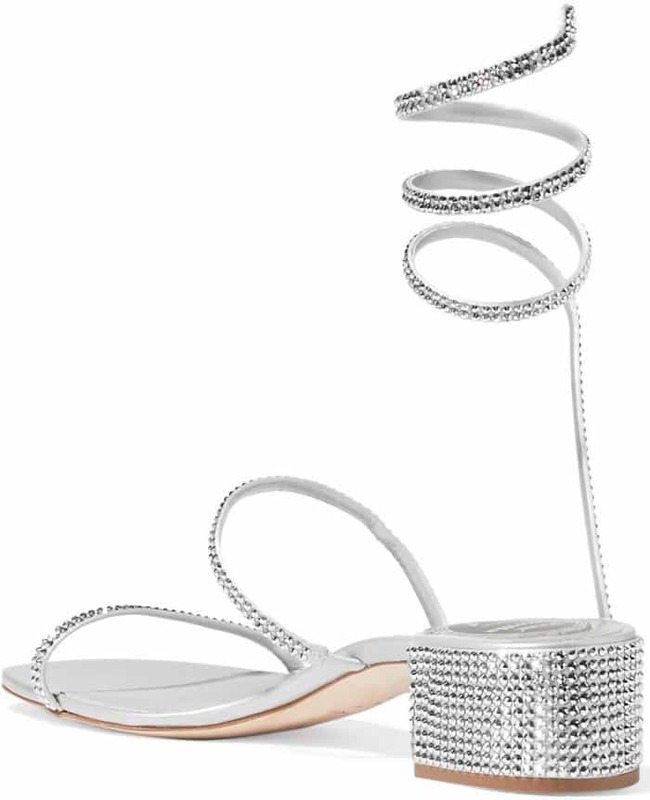 These silver sandals boast of coiled straps that sinuously wrap around the ankles. 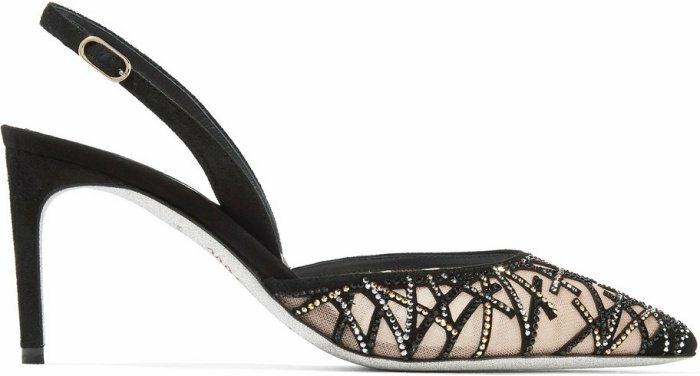 They feature sparkly crystal embellishments, low block heels, and a slip-on style. Model wearing Rene Caovilla’s crystal-embellished satin and leather sandals with a Zimmermann dress. 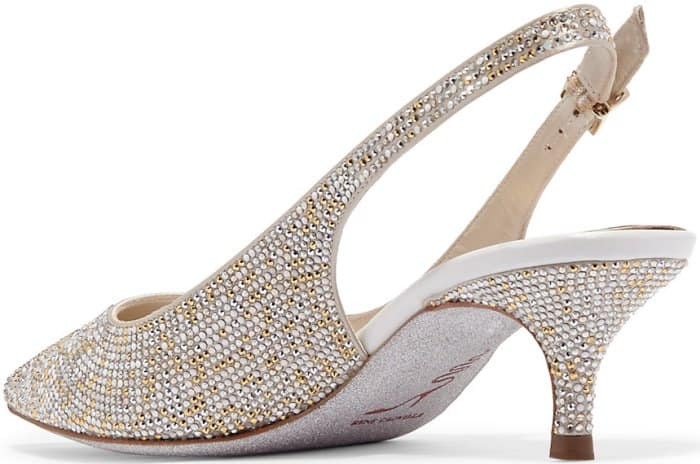 These slingback pumps are adorned with silver, gold, white and pearlescent Swarovski crystals for a dazzling finish. 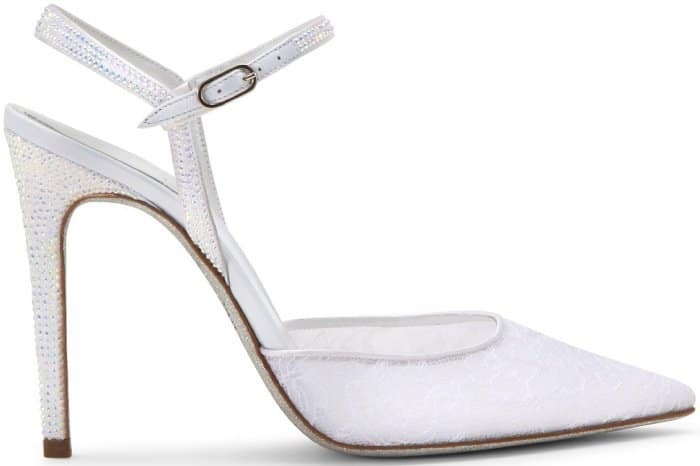 These shoes are crafted from ivory satin and also feature buckle-fastening straps, pointy toes, low heels and glittering soles. Model wearing Rene Caovilla’s Swarovski crystal-embellished satin slingback pumps with a Chloe blouse and Stella McCartney pants. 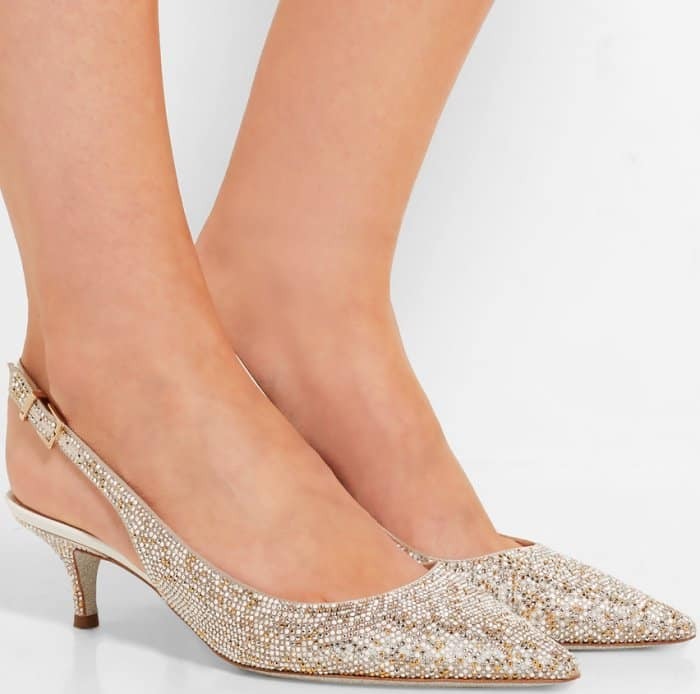 Crafted from lustrous beige satin and leather, these shoes are generously adorned with crystals for a luxe finish. They also feature pointy toes and leather ties that wrap elegantly around the ankles. 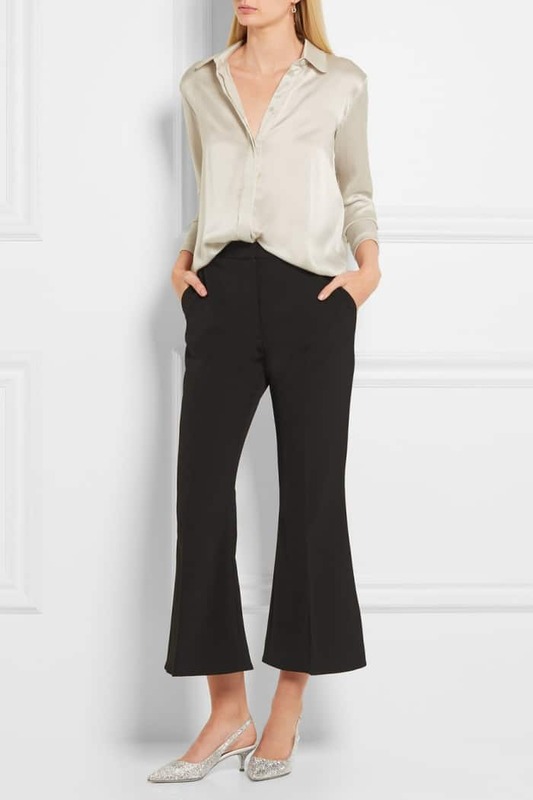 Model wearing Rene Caovilla’s crystal-embellished satin pumps with a Cushnie et Ochs top (available at Net-A-Porter) and Fendi wide-leg pants (also available at Net-A-Porter). 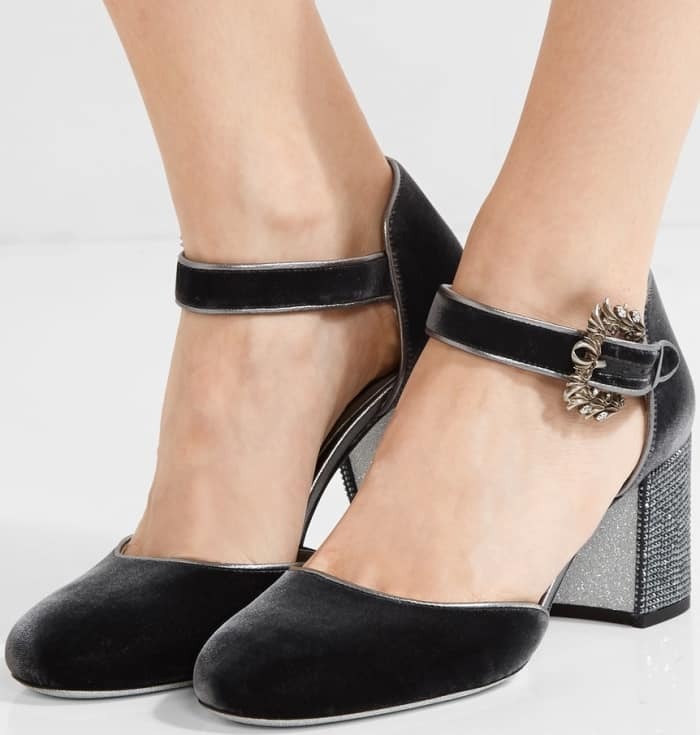 This black velvet pair features buckle-fastening ankle straps, metallic leather trims and gunmetal crystals on block heels. 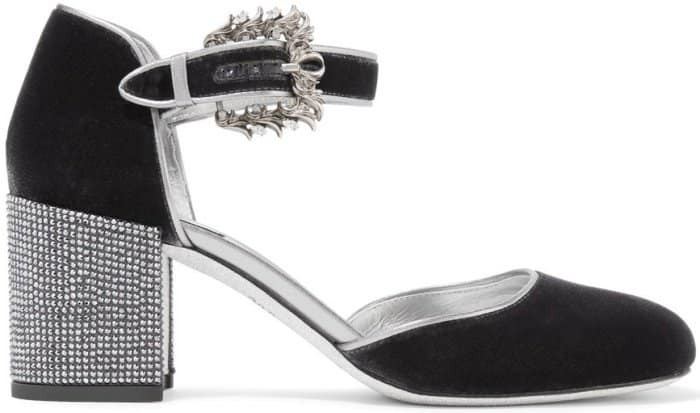 In addition, these shoes took inspiration from Venetian art with their ornate buckle embellishments. 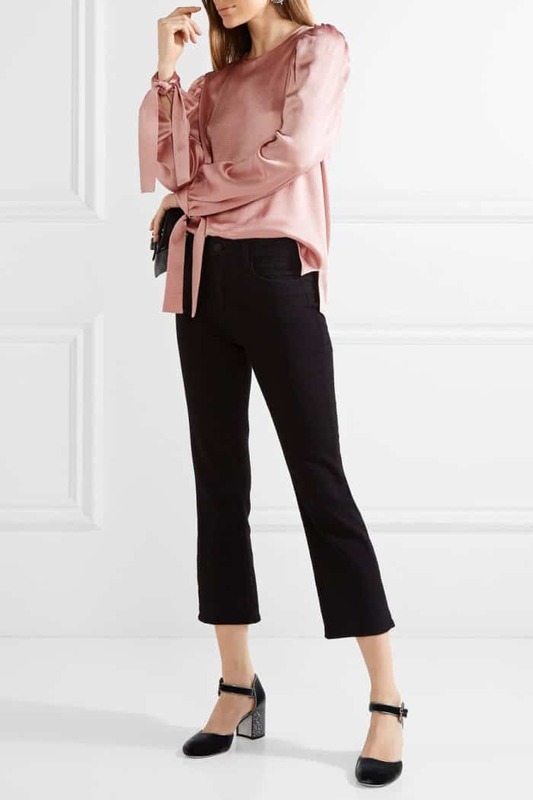 Model wearing Rene Caovilla’s crystal-embellished leather-trimmed velvet pumps with a hammered-satin top from MSGM (available at Net-A-Porter) and the “Serena” bootcut jeans from L’Agence (also available at Net-A-Porter). Crafted from black and taupe suede, these shoes feature delicate wraparound straps and satin-lined cushioned soles. 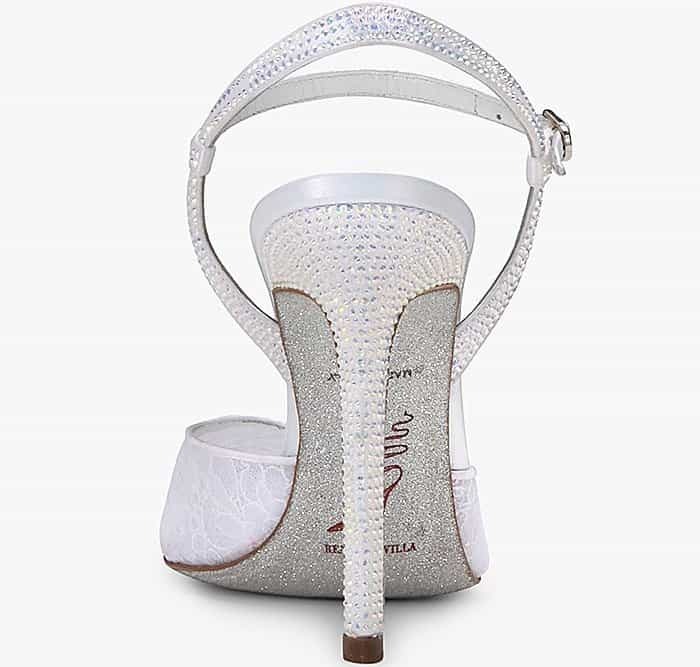 These sandals are also dotted with crystals for a sparkly touch. 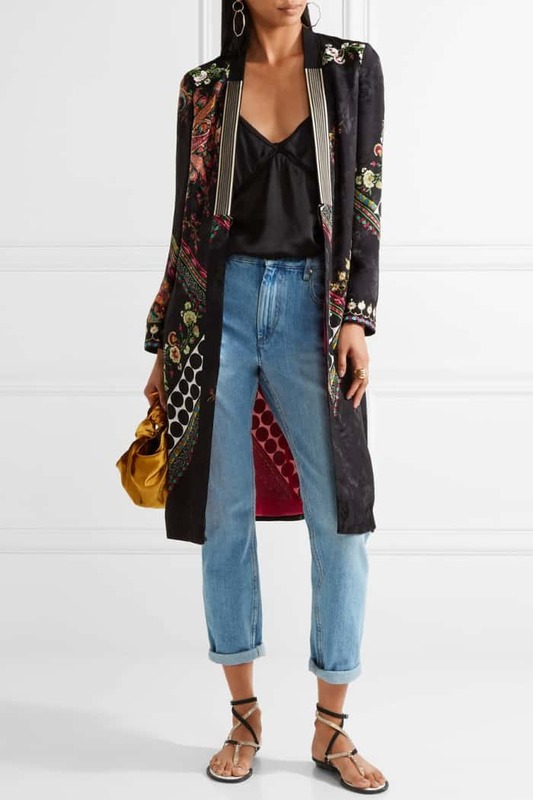 Model wearing Rene Caovilla’s crystal-embellished suede sandals with an Etro jacket (available at Net-A-Porter), a Cami NYC “Bailey” camisole (also available at Net-A-Porter), and Current/Elliott “Original” high-rise jeans (available at Net-A-Porter). 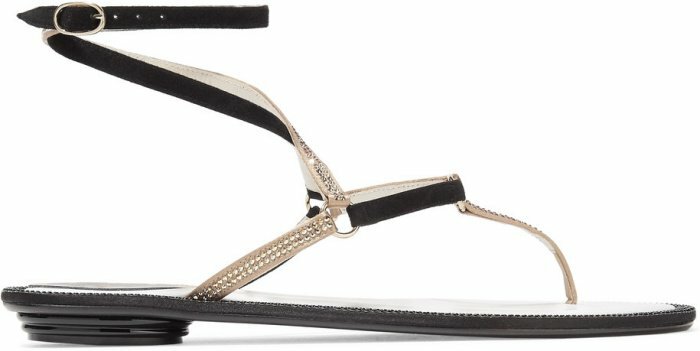 These elegant open-toed sandals feature patent block heels and the fashion house’s signature coiled straps. 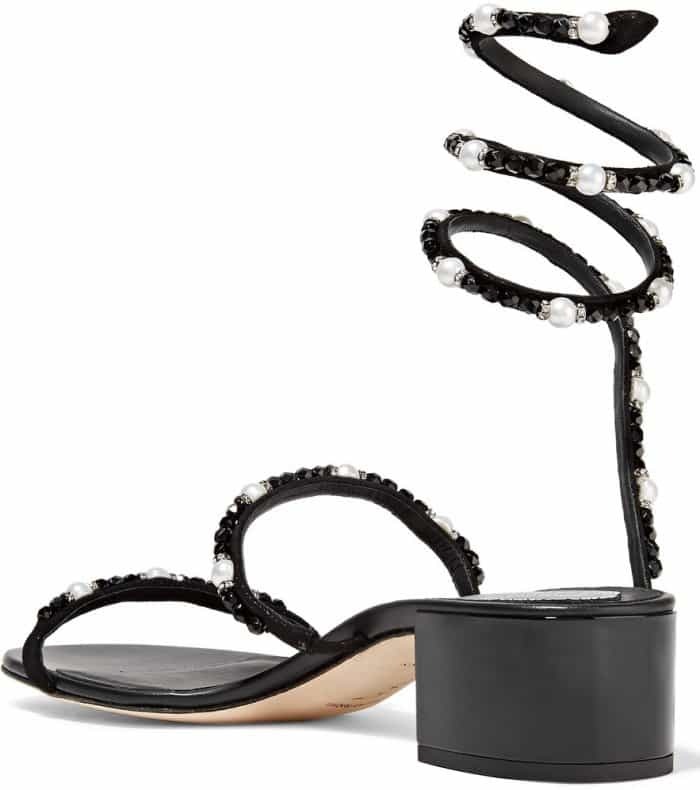 This black nubuck pair is also embellished with crystals, faux pearls and black beads. 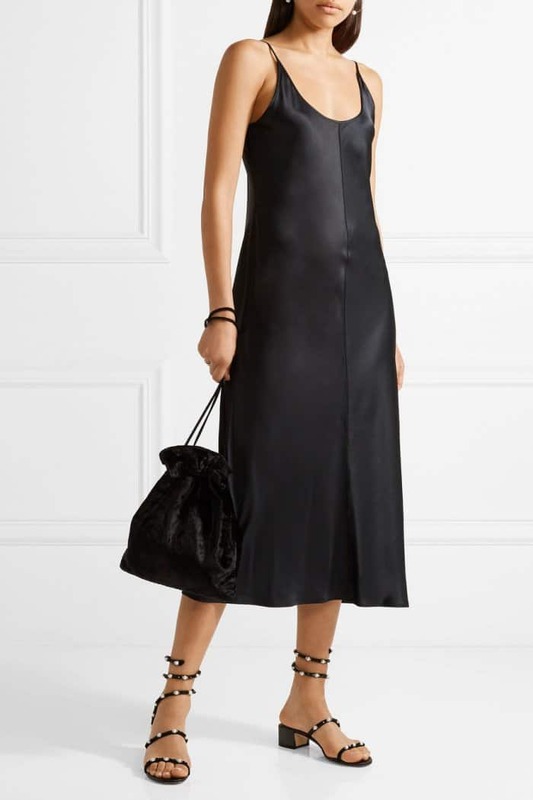 Crafted from black suede and beige mesh, these shoes feature buckle-fastening slingback straps and a pointed-toe silhouette. 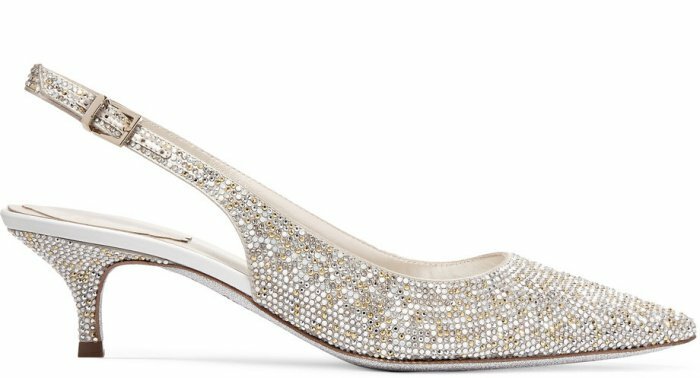 Sparkly crystals adorn these pumps for just the right amount of ornamentation. 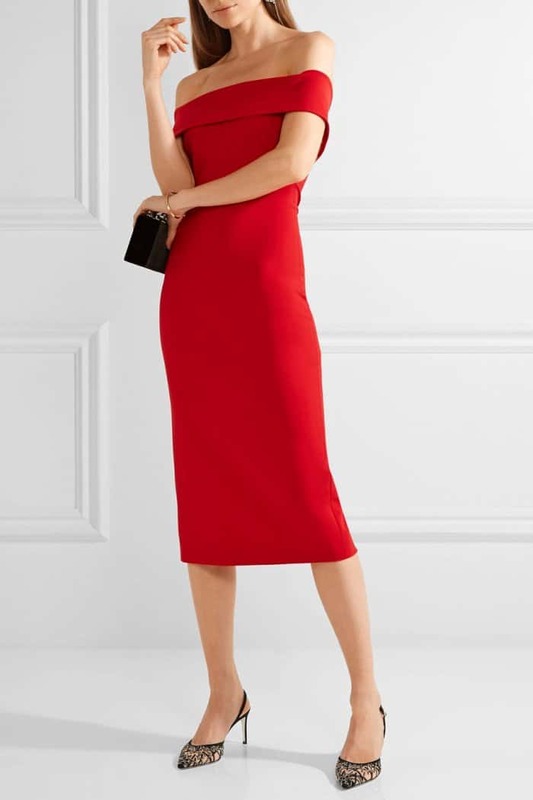 Model wearing Rene Caovilla’s crystal-embellished suede and mesh pumps with the “Layla” off-the-shoulder dress from Cushnie et Ochs (available at Net-A-Porter). 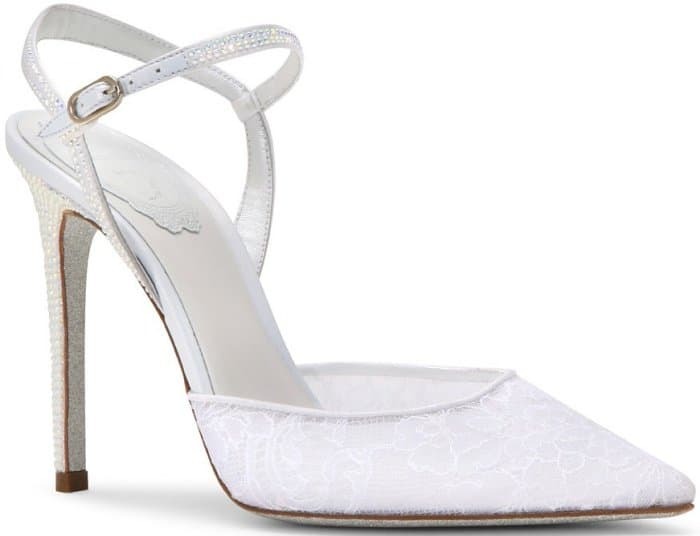 Finally, we have these elegant white court shoes crafted from dainty white lace and adorned with tonal diamante embellishments. 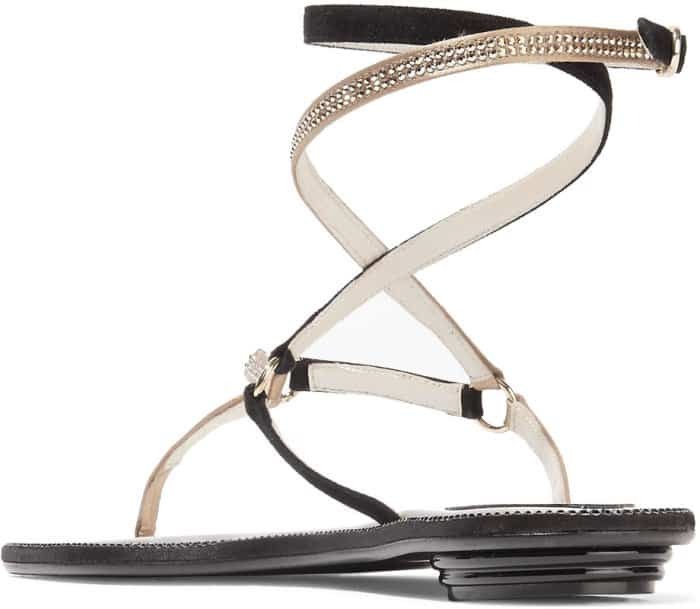 They feature slender slingback straps, side buckle closures and a pointed-toe silhouette. 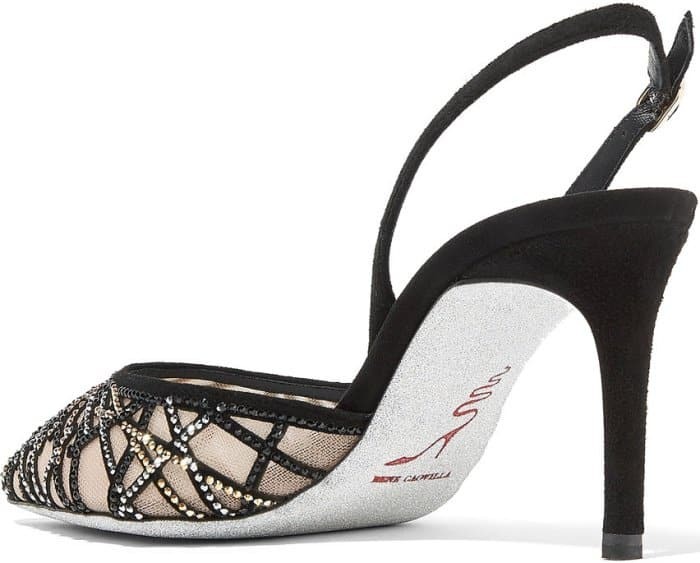 In addition, these pumps have glittered outsoles and crystal-embellished mid heels for a luxe finish. 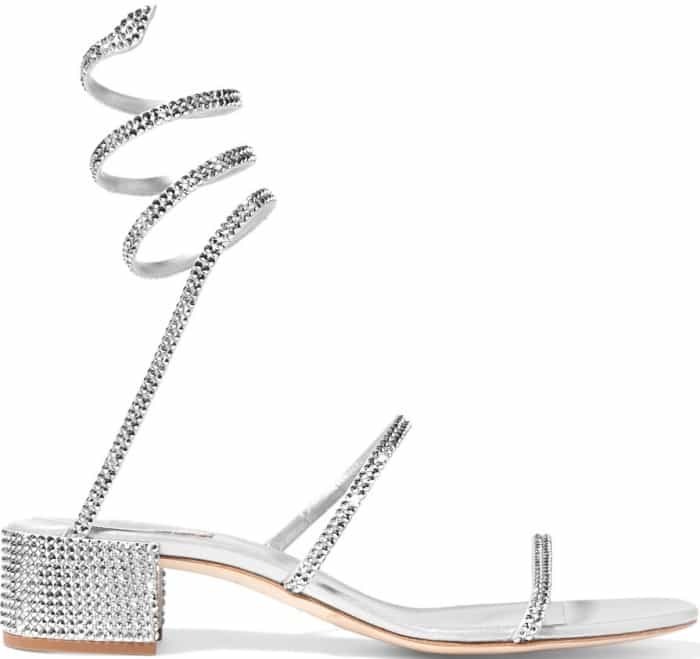 What do you think of these crystal-embellished shoes from Rene Caovilla? 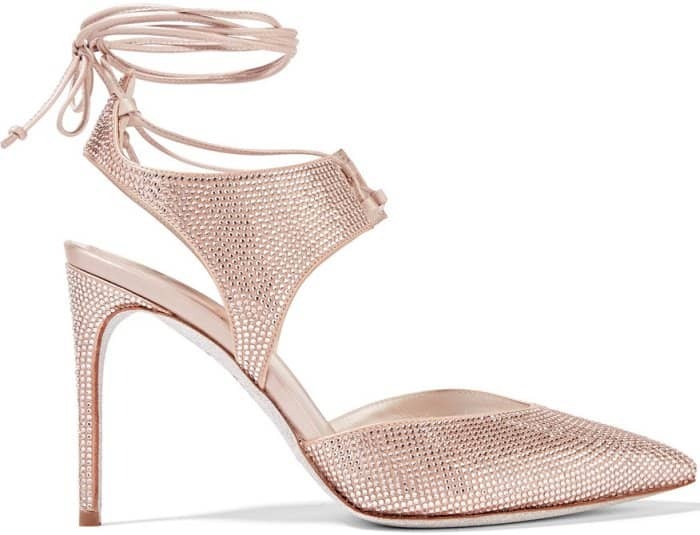 Which sparkly pair has made it onto your wish list?